Instead of proposing the generic topic of the First World War poets, it would be far more motivating to sketch a synoptic view of its literary legacy. 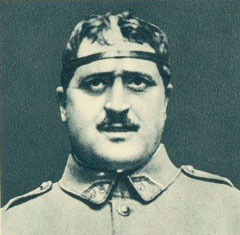 Take the french case of Guillaume Apollinaire. His enthusiam for the Italian Futurism movement and the close friendship with Giuseppe Ungaretti did not prevent him from writing some war poems that we can consider unique in a survey of World War I poetry. Marinetti and Ungaretti are real presences of his poetry, but the landscape rising up from these verses represents a brand new achievement for the whole world literature.